Make a double batch of this Avocado Bacon Pinwheels recipe because it disappears quickly! This Avocado Bacon Pinwheels Recipe can do double duty as an appetizer for a party or an easy portable lunch. However you decide to serve it, it checks a lot of boxes. It’s make-ahead, filling, easy to transport and comes together in minutes. How’s that for a versatile recipe? It’s hard to go wrong with a snack that has all of my favorite ingredients in it: avocado, bacon AND cheese! 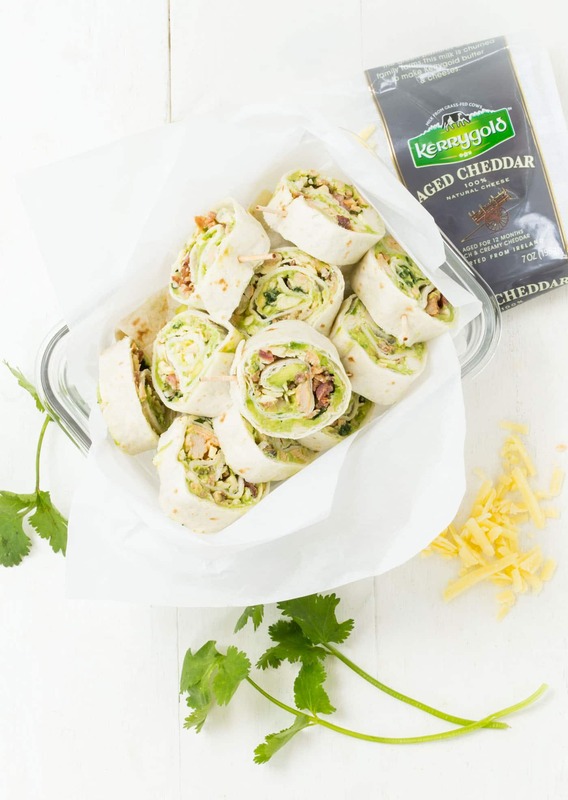 Naturally I added my favorite Kerrygold® Aged Cheddar cheese. Its rich flavor is a tasty addition without being overpowering and complements the chicken and bacon perfectly. Sprinkle some fresh cilantro on top and the flavor combination cannot be beat. Don’t spread the filling all of the way to the edge of the tortilla. Leave an inch around the edges will help prevent the filling from falling out when you roll them. Roll your tortilla as tightly as you can without smashing the filling. You can eat these pinwheels right away, but they are a lot easier to slice after they have been chilled for a hour. If you are short on time, pop them into the freezer for a few minutes. Keep the rolled up tortillas wrapped tightly in foil or plastic wrap until you slice them so they don’t dry out. Use a sharp serrated knife to slice them cleanly. These Avocado Bacon Pinwheels are one of my new favorite appetizers. I love that they are so filling without being really heavy and rich. It’s just an added bonus that you don’t need a dipping sauce for them and the fact that they are portable make them great picnic fare. Tip: Don’t skimp on the lime juice. Not only does it brighten the flavors, it keeps your avocado a nice bright green color! These Avocado Bacon Pinwheels are a great appetizers to bring to a party. In a medium bowl, mash the avocado and stir in the Greek yogurt and lime juice. Add chicken, cheese, and bacon to bowl and stir to combine. Season to taste with salt and pepper. Divide mixture evenly among the tortillas and spread evenly almost to the edge. 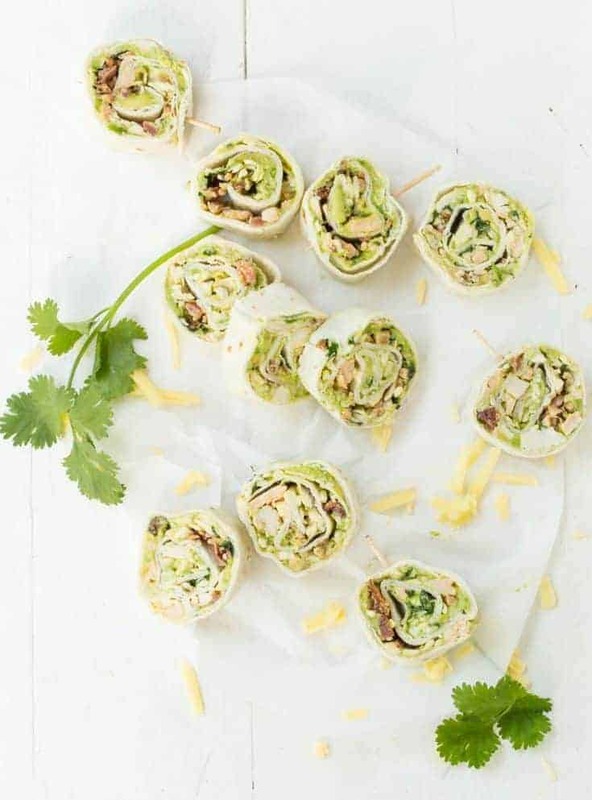 Sprinkle with chopped cilantro and roll up pinwheel style. Chill for at least one hour and slice into 1/4 inch pieces and serve.